, was a Scotch gentleman, who lived in the sixteenth century, and has furnished a sort of biographical romance. 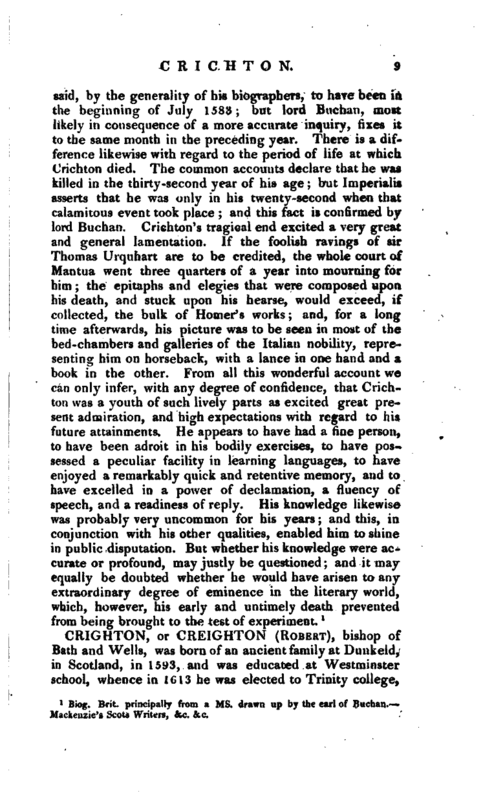 His endowments both of body and mind were esteemed so great, that he obtained the appellation of “The admirable Crichton,” and by that title he has continued to be distinguished down to the present day. The accounts given of his abilities and attainments are indeed so wonderful, that they seem scarcely to be credible; and many persons have been disposed to consider them as almost entirely fabulous, though they have been delivered with the. utmost confidence, and without any degree of hesitation, by various writers. The time of Crichton’s birth is said, by the generality of authors, to have been in 1551; but according to lord Buchan, it appears from several circumstances, that he was born in the month of August, 1560. His father was Robert Crichton of Elliock in the county of Perth, and lord advocate of Scotland in queen Mary’s reign, from 1561 to 1573; part of which time he held that office in conjunction with Spens of Condie. The mother of James Crichton was Elizabeth Stuart, the only daughter of sir James Stuart of Beath, who was a descendant of Robert duke of Albany, the third son of king Robert II. by Elizabeth Muir, or More, as she is commonly called. It is hence evident, that when the admirable Crichton boasted, as he did abroad, that he was sprung from Scottish kings, he said nothing but what was agreeable to truth. Nevertheless, Thomas Dempster, who sufficiently amplifies his praises in other | respects, passes a severe censure upon him on this account; which is the more remarkable, as Dempster lived so near the time, and was well acquainted with the genealogies of the great families of Scotland. 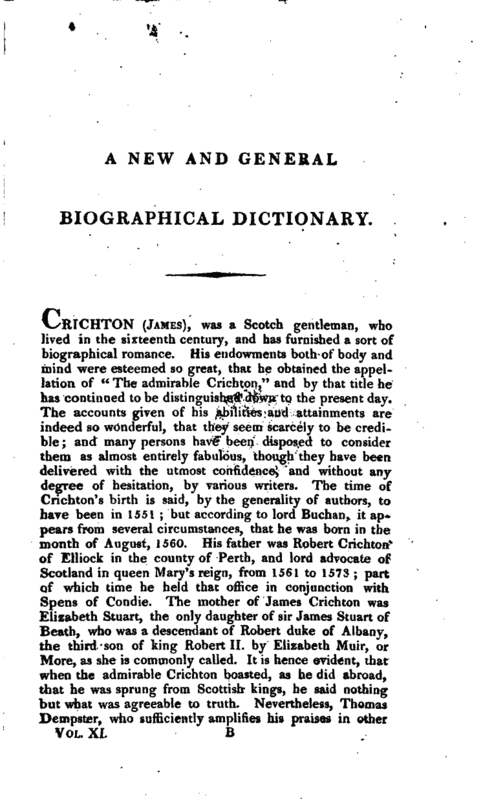 James Crichton is said to have received his grammatical education at Perth, and to have studied philosophy in the university of St. Andrew. His tutor in that university was Mr. John Rutherford, a professor at that time famous for his learning, and who distinguished himself by writing four books on Aristotle’s Logic, and a commentary on his Poetics. 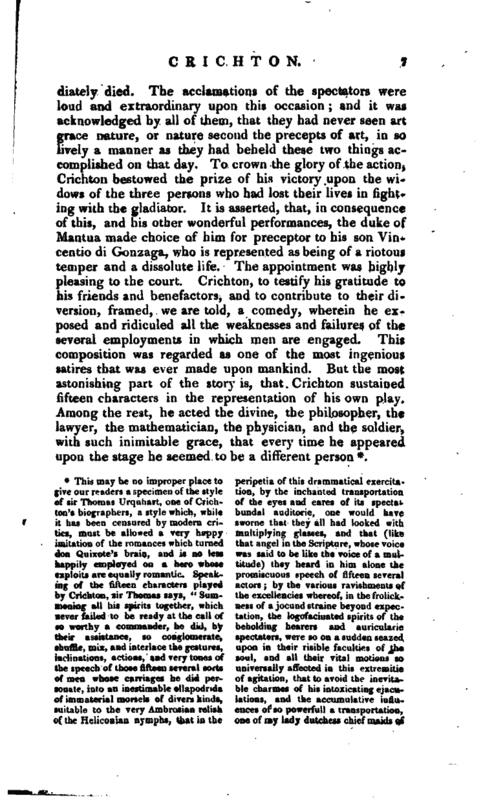 But nothing, according to Mackenzie, can give us a higher idea of Rutherford’s worth and merit, than his being master of that wonder and prodigy of his age, the great and admirable Crichton. However, it is not to this professor alone that the honour is ascribed of having formed so extraordinary a character. There are others who may put in their claim to a share in the same glory; for Aldus Manutius, who calls Crichton first cousin to the king, says that he was educated, along with his majesty, under Buchanan, Hepburn, and Robertson, as well as Rutherford. Indeed, whatever might be the natural force of his genius, jnany masters must have been necessary, in order to his acquiring such a variety of attainments as he is represented to have possessed. For it is related, that he had scarcely reached the twentieth year of his age, when he had run through the whole circle of the sciences, and could speak and write to perfection in ten different languages. Nor was this all; for he had likewise improved himself to the highest degree in riding, dancing, and singing, and in playing upon all sorts of instruments. 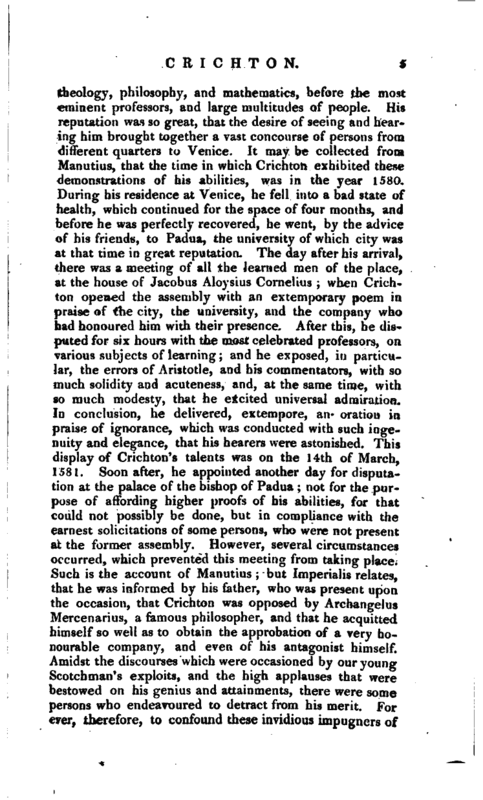 Crichton, being thus accomplished, went abroad upon his travels, and is said to have gone to Paris; of his transactions at which place the following account is given. He caused six placards to be fixed on the gates of the schools, halls, and colleges belonging to the university, and on the pillars and posts before the houses of the most renowned men for literature in the city, inviting all those who were well versed in any art or science to dispute with him in the college of Navarre, that day six weeks, by nine o’clock in the morning, where he would attend them, and be ready to answer to whatever should be proposed to him in any art or science, and in any of these twelve languages, Hebrew, Syrlac, Arabic, Greek, Latin, Spanish, French, Italian, English, Dutch, Flemish, and Sclavonian; and this | either in verse or prose, at the discretion of the disputant. 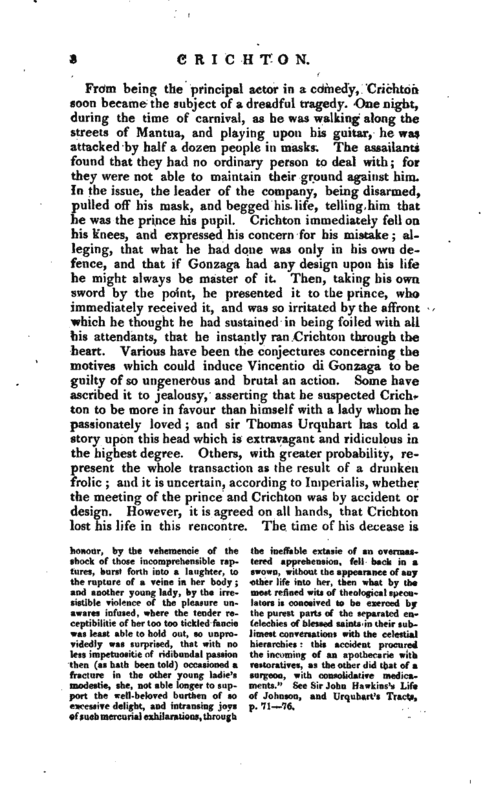 During this whole time, instead of closely applying to his studies, he regarded nothing but hunting, hawking, tilting, vaulting, riding of a well-managed horse, tossing the pike, handling the musquet, and other military feats; or else he employed himself in domestic games, such as balls, concerts of music, vocal and instrumental; cards, dice, tennis, and other diversions of youth. This conduct so provoked the students of the university, that, beneath the placard that was fixed on the Navarre gate, they caused the following words to be written: “If you would meet with this monster of perfection, to search for him either in the tavern or t)ie brothel is the readiest way to find him.” Nevertheless, when the day appointed arrived, Crichton appeared in the college of Navarre, and acquitted himself beyond expression in the disputation, which lasted from nine in the morning till six at night. At length, the president, after extolling him highly for the many rare and excellent endowments which God and nature had bestowed upon him, rose from his chair; and, accompanied by four of the most eminent professors of the university, gave him a diamond ring and a purse full of gold, as a testimony of their approbation and favour. 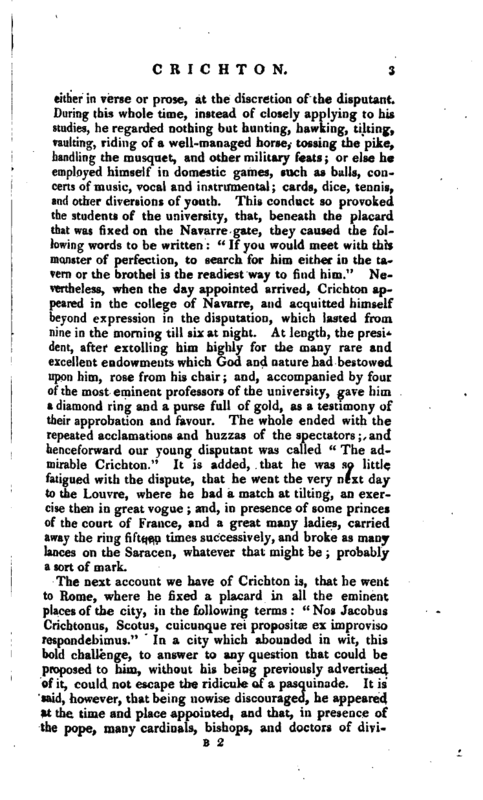 The whole ended with the repeated acclamations and huzzas of the spectators; and henceforward our young disputant was called “The admirable Crichton.” It is added, that he was so little fatigued with the dispute, that he went the very next day to the Louvre, where he had a match’at tilting, an exercise then in great vogue; and, in presence of some princes of the court of France, and a great many ladies, carried away the ring fifteen times successively, and broke as many lances on the Saracen, whatever that might be; probably a sort of mark. Sæepe humectabam guttis stillantibus ora." 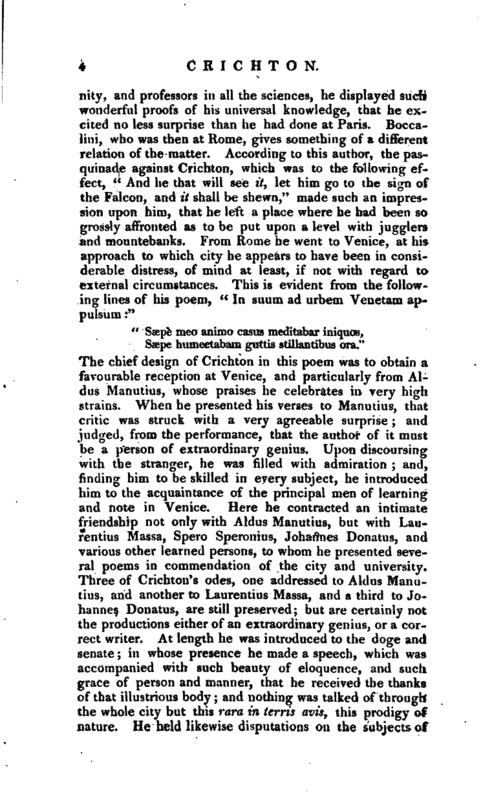 The chief design of Crichton in this poem was to obtain a favourable reception at Venice, and particularly from Aldus JMamitius, whose praises he celebrates in very high strains. When he presented his verses to Manutins, that critic was struck with a very agreeable surprise; and judged, from the performance, that the author of it must be a person of extraordinary genius. Upon discoursing with the stranger, he was filled with admiration; and, finding him to be skilled in every subject, he introduced him to the acquaintance of the principal men of learning and note in Venice. Here he contracted an intimate friendship not only with Aldus Manutius, but with Laurentius Massa, Spero Speronius, Johannes Donatus, and various other learned persons, to whom he presented several poems in commendation of the city and university. Three of CrichtoH’s odes, one addressed to Aldus Manutius, and another to Laurentius Massa, and a third to Johannes Donatus, are still preserved; but are certainly not the productions either of an extraordinary genius, or a correct writer. At length he was introduced to the doge and senate; in whose presence he made a speech, which was accompanied with such beauty of eloquence, and such grace of person and manner, that he received the thanks of that illustrious body; and nothing was talked of through the whole city but this rara in tcrris avis, this prodigy of nature. He held likewise disputations on the subjects of | theology, philosophy, and mathematics, before the most eminent professors, and large multitudes of people. His reputation was so great, that the desire of seeing and hearing him brought together a vast concourse of persons from different quarters to Venice. It may be collected from Manutius, that the time in which Crichton exhibited these demonstrations of his abilities, was in the year 1580. During his residence at Venice, he fell into a bad state of health, which continued for the space of four months, and before he was perfectly recovered, he went, by the advice of his friends, to Padua, the university of which city was at that time in great reputation. The day after his arrival, there was a meeting of all the learned men of the place, at the house of Jacobus Aloysius Cornelius; when Crichton opened the assembly with an extemporary poem in praise of the city, the university, and the company who had honoured him with their presence. 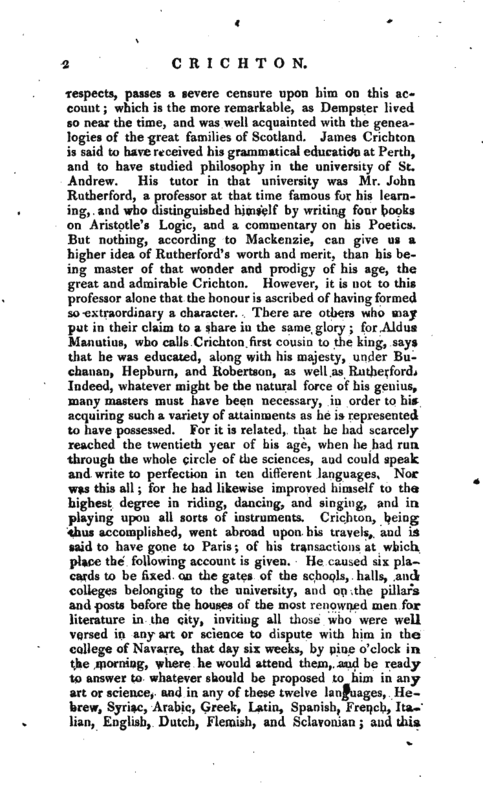 After this, he disputed for six hours with the most celebrated professors, on various subjects of learning; and he exposed, in particular, the errors of Aristotle, and his commentators, with so much solidity and acuteness, and, at the same time, with so much modesty, that he excited universal admiration. In conclusion, he delivered, extempore, an oration in praise of ignorance, which was conducted with such ingenuity and elegance, that his hearers were astonished. This display of Crichton’s talents was on the 14th of March, 1581. Soon after, he appointed another day for disputation at the palace of the bishop of Padua; not for the purpose of affording higher proofs of his abilities, for that could not possibly be done, but in compliance with the earnest solicitations of some persons, who were not present at the former assemhly. However, several circumstances occurred, which prevented this meeting from taking place. Such is the account of Manutius; but Imperialis relates, that he was informed by his father, who was present upon the occasion, that Crichton was opposed by Archangel us Mercenarius, a famous philosopher, and that he acquitted himself so well as to obtain the approbation of a very honourable company, and even of his antagonist himself. Amidst the discourses which were occasioned by our young Scotchman’s exploits, and the high applauses that were bestowed on his genius and attainments, there were some persons who endeavoured to detract from his merit. For ever, therefore, to confound these invidious impugners of | his talents, he caused a paper to be fixed on the gates of St. John and St. Paul’s churches, in which he offered to prove before the university, that the errors of Aristotle, and of all his followers, were almost innumerable; and that the latter had failed, both in explaining their master’s meaning, and in treating on theological subjects. He promised likewise to refute the dreams of certain mathematical professors; to dispute in all the sciences and to answer to whatever should be proposed to him, or objected against him. All this he engaged to do, either in the common logical way, or by numbers and mathematical figures, or in an hundred sorts of verses, at the option of his opponents. 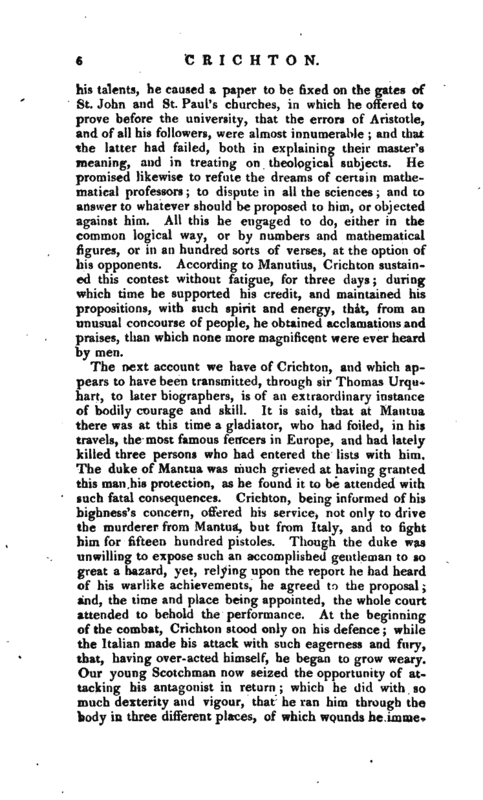 According to Manutius, Crichton sustained this contest without fatigue, for three days; during which time he supported his credit, and maintained his propositions, with such spirit and energy, that, from an unusual concourse of people, he obtained acclamations and praises, than which none more magnificent were ever heard by men. honour, by the vehemencie of the shock of those incomprehensible raptures, burst forth into a laughter, to the rupture of a veine in her body; and another young lady, by the irresistible violence of the pleasure unawares infused, where the tender receptibilitie of her too too tickled fancie was least able to hold out, so unprovidedly was surprised, that with no less impetuositie of ridibundal passion then (as hath been told) occasioned a fracture in the other young ladie’s modestie, she, not able longer to support the well-beloved burthen of so of excessive delight, and intransing joys of such mercurial exhilarations, through the ineffable extasie of an overmastered apprehension, fell back in a swown, without the appearance of any other life into her, then what by the most refined wits of theological speculators is conceived to be exerced by the purest parts of the separated entelechies of blessed saints in their sublimest conversations with the celestial hierarchies; this accident procured the incoming of an apothecarie with restoratives, as the other did that of a surgeon, with consolidative medicaments." See Sir John Hawkins’s Life Johnson, and Urquhart’s Tracts, p. 71—76. Biog. Brit. principally from a ms. drawn up by the earl of Buchan.— Mackenzie’s Scots Writers, &.c. &c.